Adoption has changed me in a thousand ways. I see my husband differently, after what we went through together. I see the world differently, having seen a part of it that will live with me forever, manifested most clearly in the dark chocolate baby dancing through my hallways. I see God way differently, after what he did and didn’t do, what he said and didn’t say. But maybe most noticeably, I see my kids differently. I see parenting differently. Before adoption, I tended to be nervous, by-the-book and constantly looking to other moms for validation and recognition for all I was doing. Am I doing OK? was my constant refrain. Am I enough? I read the books. Especially with my girl, my sweet firstborn, I followed all the rules and consulted the manuals at the first unexpected circumstance. Even now, I can be too hard on her, expect too much. After my (biological) son was born, I eased a little. I recognized where I was pushing. But still, those deep questions remained at the core of my being. My insecurity didn’t shrink much. Can you believe I’d never thought of that before? Not until the moment our new son was in our arms? Not only was it all about parenting, but the kind of parenting that we’d have to employ was different than everything I’d learned from the books. Even as an 8-month-old infant, Benjamin knew a few things: He had known a mother in utero, then lost her. He had known another caregiver, then another, and then lost them, too. The world was already a dangerous and unpredictable place, even for simple needs like food, and no one could be trusted. He also knew that he didn’t know us at all. Teaching a child to trust requires taking the long way around. A couple weeks in his native country followed by a sweaty and I-wish-I-could-forget plane ride doesn’t touch it. It’s hour after hour of being there, meeting small need after small need. It’s eye contact, it’s repeating and validating and saying over and over for a lifetime, You’re valued. You’re wanted. You’re precious to me, and I would do anything for you. Not with those words, exactly, though of course you need the words, too. It’s not telling, it’s showing, again and again and again. Fostering attachment means meeting needs in unexpected ways. It means a former cry-it-out parent has to think anew about what that method will communicate to a child who learned that crying doesn’t get a response in the orphanage. It means going slowly until months later when your child learns to want physical touch, to need nurturing. It means you might get suspicious of attachment disorder when your baby is unusually calm and docile, too easy-going and agreeable. You go back to a newborn mindset, no matter how old your child is. A newborn baby fussing elicits an almost instant response in his mother, finding clues to what is wrong, how to help. The four-year-old you just brought home from foster care or Ukraine may have different tools at her disposal to communicate that something is wrong, but you still have to look for clues. A four-year-old who has always had a family may act out for attention or out of defiance. But the same behavior in your adopted child should send you searching: What is she saying? Does she need to know that I’m her mommy forever? Does she need hope for her future? Does she need me to show her she can trust me? But aren’t those the questions all our kids ask us, biological or adopted? Our adopted ones may need to hear the answers more consistently, louder or in many different ways, but here’s how adoption changed my parenting: I realized that my other two kids need the same messages. Defiance isn’t ever only defiance. Behavior is never just behavior. When the temper tantrums start now, I try to look beyond those screams to the deeper need. What does he need to hear from me right now? When the attitude problems begin and it just makes me want to push them away, I know now that’s precisely when they need me to draw near. When their middle-of-the-night needs cut into my alertness and ability to do the work set before me during the day, I remind myself it’s temporary, and it’s important to show an all-the-time love to all my kids, no matter the hour, no matter how old. They all have the same core needs, and they’re the same as mine: Do I matter? Am I loved? Am I enough? And in finding grace for my children’s struggles, I’ve also found God’s heart for me. I’ve seen his grace, and I finally, truly believe it. Because he gives me grace, because he doesn’t hold up those expectations of me like I do, I am free. I give myself the same grace he gives me. The books can give me tools, but they’re not a measuring stick anymore. Other mothers’ practices can inspire, but I don’t need to compare mine with theirs. Like God does of me, I expect imperfection. I know I won’t do it perfectly, but adoption has helped me stop focusing on the methods so much. Adoption has helped me see the heart — my son’s heart, all my kids’ hearts, my own heart. And most beautifully, God’s heart. 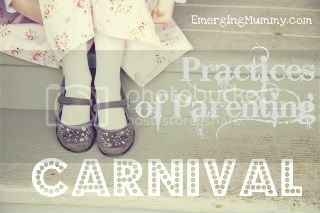 I’m excited to link up with one of my favorite bloggers, Sarah Bessey, for her Practices of Parenting Carnival today. Head on over and see how you can be inspired to enjoy parenting today. I just found your blog and I am so glad I did! You blog about what I have come to call “adoption’s greatest kept secret” and I believe it is so important that we talk about this! So glad we found each other too! Your Twitter profile sounds a lot like me! Looking forward to checking out your blog! I saw that too 🙂 Although that is the “theme” for my blog. Thanks for the lovely post. I am here from the Carnival, and I have a lot of hopes and dreams for adopting. I will be back to read more! Woohoo carnival! So glad you came by. Looking forward to continuing the conversation with you! This has been a journey to grace with a big and little G as well. Our adoption journey is teaching me those same things, one day at a time, God dispensing the grace and mercy I need for each day. As I accept this grace for myself it grows in my heart giving me what I need to share with others. Hugs. Yes yes yes. We give grace only because we’ve received it first. We love because He loves. I loved this post. Watching a child learn to trust is so beautiful. Watching a child learn to trust who has already learned not to is such a gift. Congratulations on your family. Thanks Kristin! Loved your post today as well. Tuning into each of my children’s needs will naturally bring greater attachment and intimacy. I love this, and I love your perspective. I am going to pass this on to three of my friends who are in the process of adopting both nationally and internationally. Thanks for sharing the love, Leanne! As a counselor, and a mommy, adopted child, and as a grown woman who hungers to find safety in the world, I view everything through an attachment lens. I love EFT (emotionally focused therapy) for marriage counseling because the premise is that couples get into trouble when they cannot reach out for safety and comfort from a vulnerable place. instead they resort to pulling away or yelling. It’s ALL about attachment and safety. Thanks for posting this. I love this so much, Lucille. I’ve never thought of the basic need for safety in relationships outside that of parent-child, but it rings so true. Safety is necessary for intimacy and attachment of any variety. Thanks so much for sharing your wisdom. Wow! This is something I’ve certainly learned, but never articulated. And, it’s so important. Thank you for giving this truth life for me! Best compliment you could have given me. It happens to me all the time, too — I read my own thoughts in someone else’s words (on another blog or in a book), and they give a clarity I needed. It’s why we need art. Thanks for your encouragement. Found you through Sarah’s parenting carnival. While I have not experienced adoption I am thrilled to share in your adoption. One of my favorite things is when people not connected to adoption otherwise join in the conversation. We can all learn so much from one another! This part right here, Kim —> “And in finding grace for my children’s struggles, I’ve also found God’s heart for me.” It’s like you’re reading my mind. Amen. Thank you so much for this gorgeous sharing of your heart. Thanks for stopping by, Sarah. What a beautiful carnival you’ve put on today — reading the posts has been affirming, humbling, inspiring. Thank you for hosting it and giving us a chance to share our unique-but-the-same struggles and joys. as an adopted mother-to-be, this post gripped my soul. this is such encouragement, just beautiful words that soaked into my soul like water into earth. you caught it, dearheart. you caught what it means to be a mother of adopted ones, because we NEED that. and you understand that. Came here from Sarah’s Carnival and look forward to reading your thoughts on adoption etc. Thanks so much for stopping by, Elizabeth! Looking forward to hearing from you as we continue the conversation. Yes! Adoption has given me glimpses of the Kingdom in ways I never, never would have experienced otherwise. Not just the outward appearance of His Kingdom here on earth, but a glimpse to the “Kingdom within me.” This is beautiful. What a beautiful thought, Suzanne. I’m not sure I’ve ever quite visualized the “Kingdom within me” before. Thanks for that.